It is good to be connected with your old colleagues. Some of them are foodies and may also guide you to new places. I received a call from one of my ex-colleagues, Azad, few days back. He told me about Amritsari Kulcha Joint in Rani Bagh which was started by his colleague’s father. It was Baisakhi and I thought celebrating it with Amritsari kulcha would be a pretty great idea. I called him back for the directions and landed up in the afternoon to savour the Amritsari kulcha. This time, I took my mother along with me. The name of this place is Shiv Food Point, and it has two outlets in Delhi. The addresses are – shop no.12, Shiv Mandir Market, Sant Nagar Road, Rani Bagh; contact numbers – 9891874446 and 9310199945, and shop no. G-1, Vardhman Crystal Plaza, LSC, CD Block, Pitampura; contact numbers – 9953399357 and 9953399367. The place is owned by Rajesh Sharma who had a chemical business in Rani Bagh. Due to the government’s new pollution control policy, he had to close down his chemical business. Hailing from Amritsar and a food lover, he started Amritsari Kulcha Joint three and a half years back in Rani Bagh, and later renamed it to Shiv Food Point as it is close to Shiv Mandir in Rani Bagh. Although I am a regular at Kulcha King, Sarojini Nagar, the quest to find out the real Amritsari Kulcha never ends. 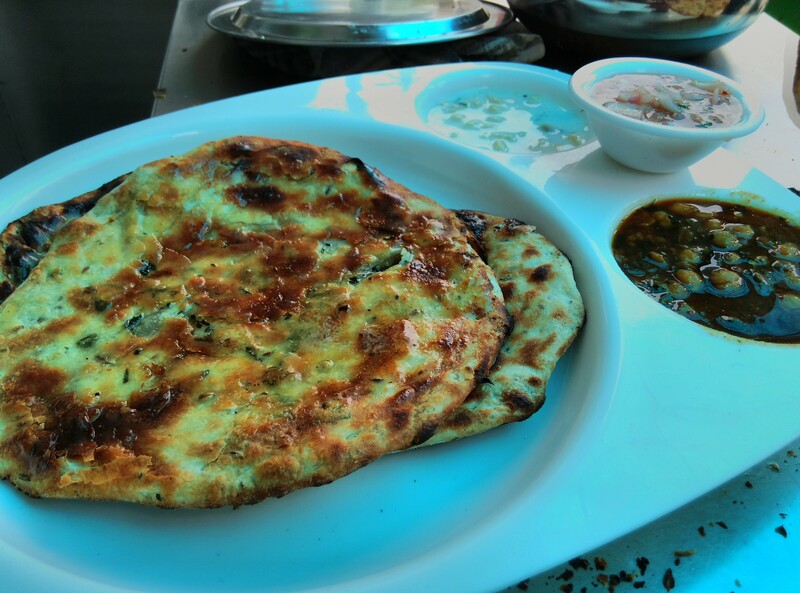 Rajesh ji described the making of Amritsari kulcha from the first step of kneading the dough to baking it in tandoor. The dough is made by kneading white flour with milk and ghee. Ajwain, jeera, dhaniya, kasuri methi, kali mirch are added to the dough, more so, in layers. Then the dough is cut with the help of a knife in small pieces, later stuffed with cauliflower or paneer. The same is flattened using both the hands. Ghee is applied to one side and later baked in the tandoor. The owner also explained how ghee makes the kulchas crispier inside and out. They offer a variety of stuffings – Amritsari aloo kulcha (Rs. 80 for 2 pieces); gobhi, aloo pyaaz, and aloo pyaz gobhi mix (Rs. 90 for 2 pieces), veg keema (Rs. 100 for 2 pieces), paneer (Rs. 110 for 2 pieces). The kulchas are served with chana, spring onions submerged in tangy tamarind chutney, and raita. Chana are cooked without ghee, garlic, and tomatoes. However, even without these, chana had a nice flavour. The masalas used in kneading the dough for kulchas are used in cooking the chana as well. The same is cooked over low flame on the tandoor. The tandoor plays a pretty important role in retaining the flavours, I am sure. The tamarind chutney served with spring onions also had a nice tangy taste. Raita was cold and fresh. All the kulchas were excellent in taste, and were slightly thick, yet crispy. They were laden with oodles of butter. I did not like the taste of butter, though. I am a big Amul fan. If you are a Amul fan too, do not forget to ask for it. I called my ex-colleague back to thank him for the wonderful recommendation. But, as I said, the quest never ends.